Forget fiction — real life is WAY scarier!! Just in time Halloween, National Geographic has two new books that kids will love almost as much as their candy! Who says monsters aren’t real? 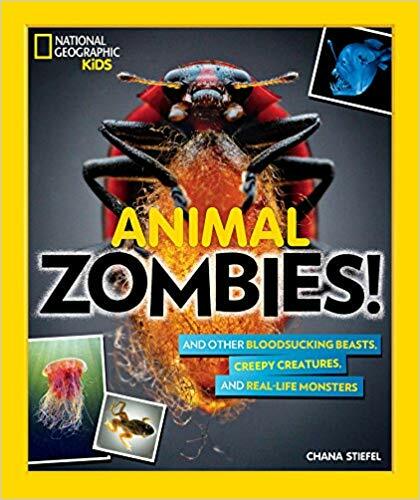 Author Chana Stiefel introduces readers to the real-life monsters of the animal kingdom as she explores the gory, gross, and ghastly behaviors these blood-sucking beasts and creepy creatures have honed in order to survive. Featuring some real-life wonders of nature like zombifying parasites, bloodsucking vampires, slithering creeps from the deep and animal aliens, this books has more than 50 howlers, prowlers and foul flesh-eaters with unusual talents. Featuring eye-popping photography, spine-tingling scientific info, the most up-to-date research, and fun facts for extra knowledge, readers also meet the “Mad Scientist” experts who study these creatures. This book is super cool and super interesting! If your kids are interested at all in animals (and what kids aren’t! ), they are going to be fascinated by ANIMAL ZOMBIES! I learned facts about bugs and animals that I never knew, and I like to think of myself as a creepy stuff expert! The Mad Scientist section is really encouraging to kids who think science is boring AND to those who love science. It proves that science is cool, and that there are all sorts of cool jobs for scientists. I definitely recommend it! Fans of Night at the Museum and the Indiana Jones saga will be fascinated by these real-life mysteries: Is there any truth to the legend of Bigfoot? Why have planes and ships suddenly disappeared in the Bermuda Triangle? Is there really a lost city of gold in the jungle of Central America? The second book in this critically praised new series covers even more of history’s most fascinating head-scratching conundrums, including the curse of the Hope Diamond, King Tut’s tomb, black holes, the puzzling disappearance of ancient civilizations, cryptic creatures of myth and legend, long-lost treasure, and so much more. Kids can dig into these spooky mysteries, uncover clues, and ponder leading scientific theories to help decipher what really happened. History is so fascinating to me. There are so many mysterious things that have happened in the past, and HISTORY’S MYSTERIES: FREAKY PHENOMENA covers lots of them! Whether your kids like history or not, I’m sure they like mysteries. If they happen to be learning while they’re reading about cool, mysterious events…even better! This book is great for kids and adults! I think it would be fun to read this with your kids because you’ll both be learning something new and spending quality time together.